Selamat datang di newsletter perdana PPIA Victoria! Mengawali tahun 2018 ini, PPIA Victoria hadir dengan wajah dan semangat yang baru. Newsletter ini akan menjadi wadah untuk informasi seputar acara PPIA Vitoria dan ranting maupun hal-hal menarik lainnya. PPIA Victoria proudly presents: "Alun-Alun 2018: 1 Nusa 1 Bangsa"!!! 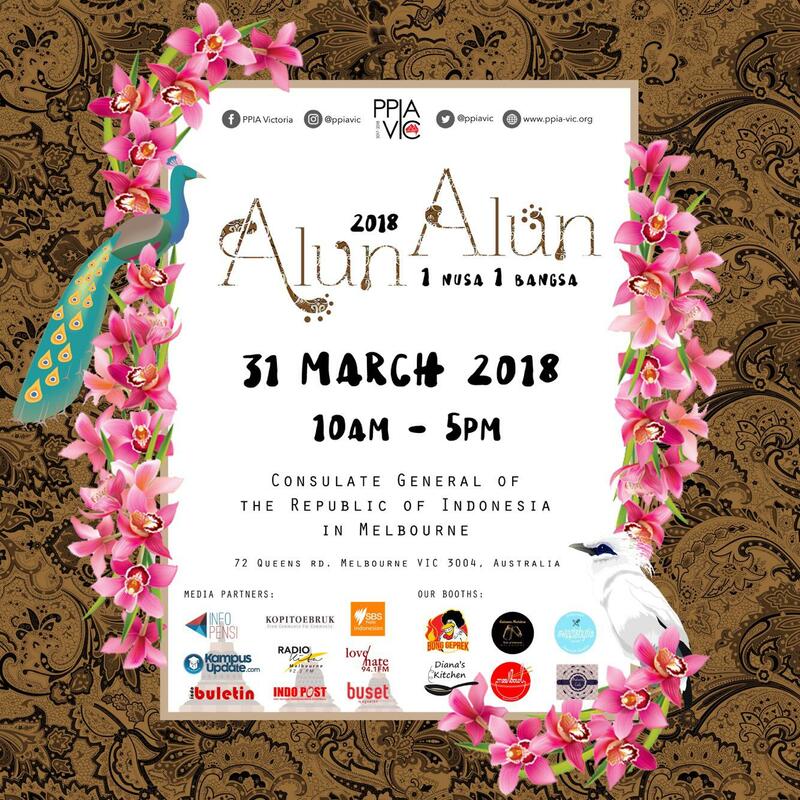 Alun Alun 2018 aims to present Indonesia's diverse but united cultures through special performances by PPIA sub-branches and various Indonesian organisations. As usual, there will be Indonesian food bazaar, games and more! Save the date to enjoy traditional Indonesian foods, watch performances and make new friends! Stay tuned on our social media for more info! Do you have decent goods that you no longer use? 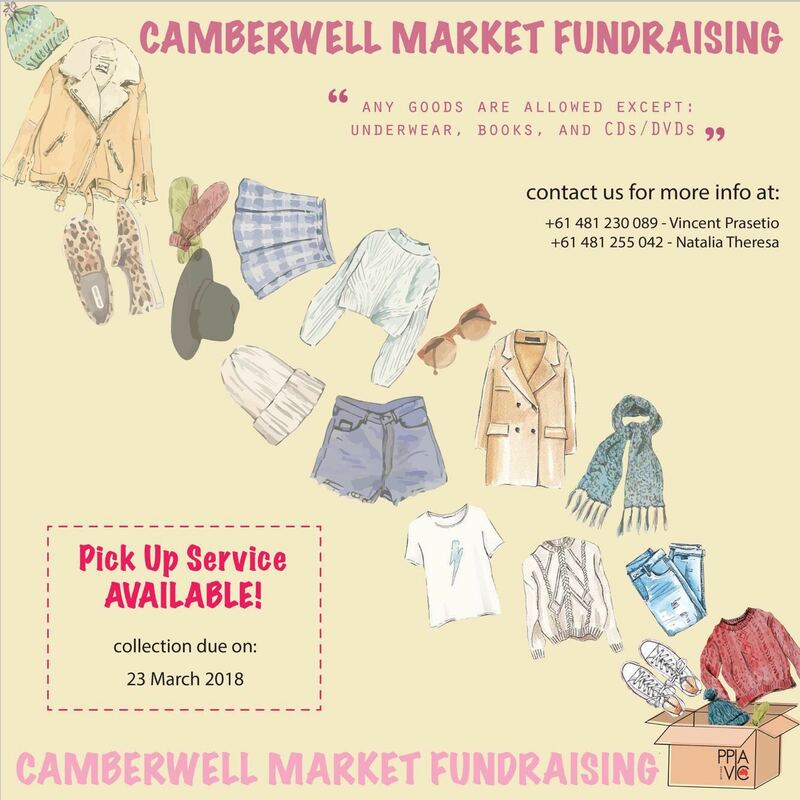 Feel free to donate them to us before 23 March 2018. Any goods are allowed except for underwear, books, and CDs/DVDs! Ps: You don't have to worry as pick up service is available for FREE! All funds raised will be contributed to our annual event Alun-Alun. Calling all volunteers! Want to know what it’s like to be part of a film festival? Look no further! 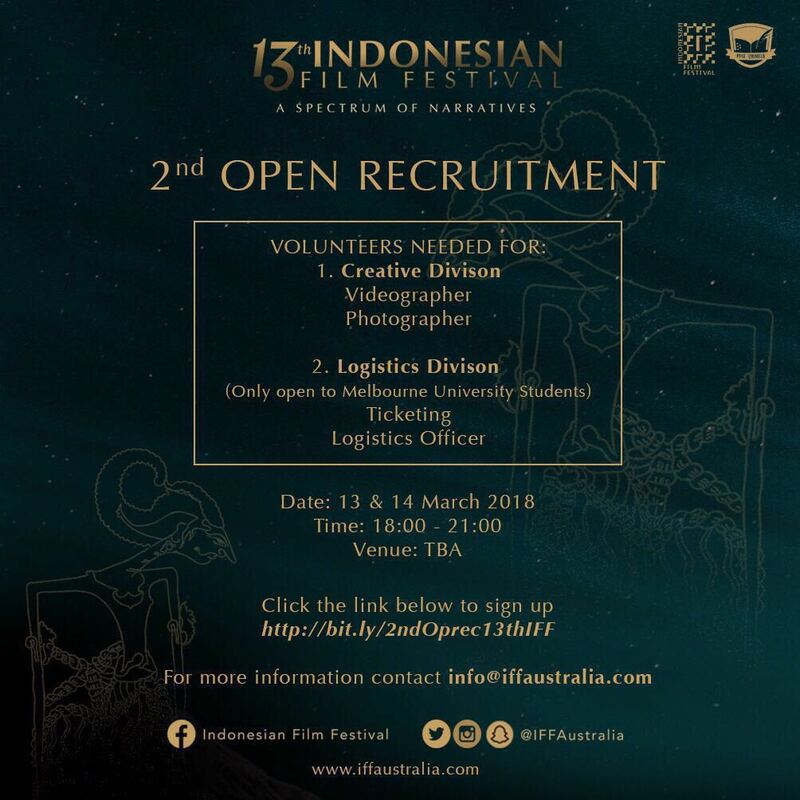 The 13th Indonesian Film Festival is looking to recruit those with an eye for aesthetics and details for the creative and logistics divisions. Simply head to http://bit.ly/2ndOprec13thIFF to sign up or contact info@iffaustralia.com for more information. Interviews will be held on the 13-14th of March 2018 from 6-9pm. Please stay tuned for updates on the venue. WE HAVE AN IMPORTANT ANNOUNCEMENT! 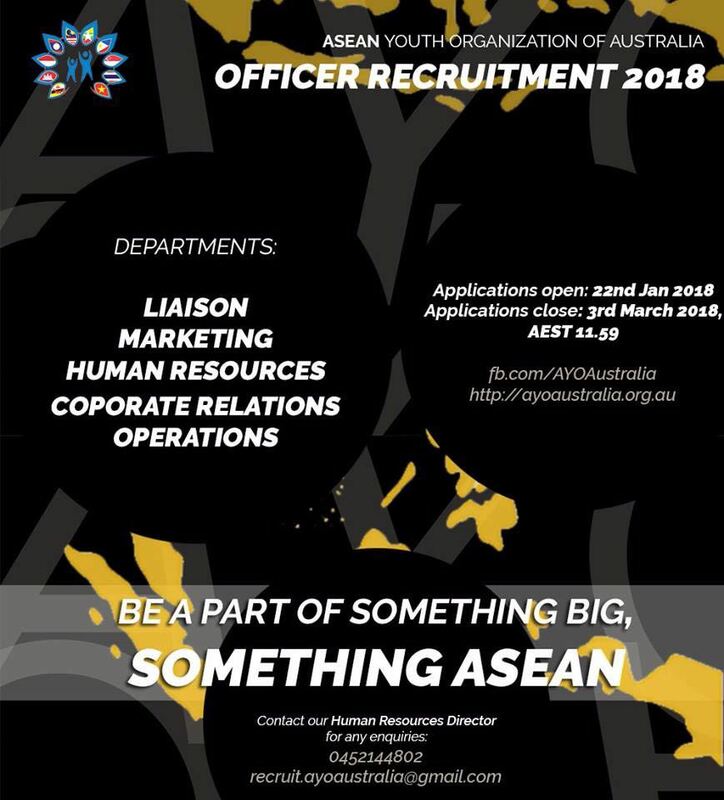 ASEAN Youth Organization Australia is beginning its third year of its operations and we would like YOU to be a PART OF SOMETHING BIG, SOMETHING ASEAN! This year, we are expanding our organisation and even introducing new initiatives so, if you think you’re up for the challenge, come join us and help us bridge the gap between the ASEAN communities. We can guarantee that anyone is welcomed to join the big family. See below for more details. Also, click the following links for descriptions and details about each department that you might be interested getting involved in. Well who doesn’t like BBQ and free food? 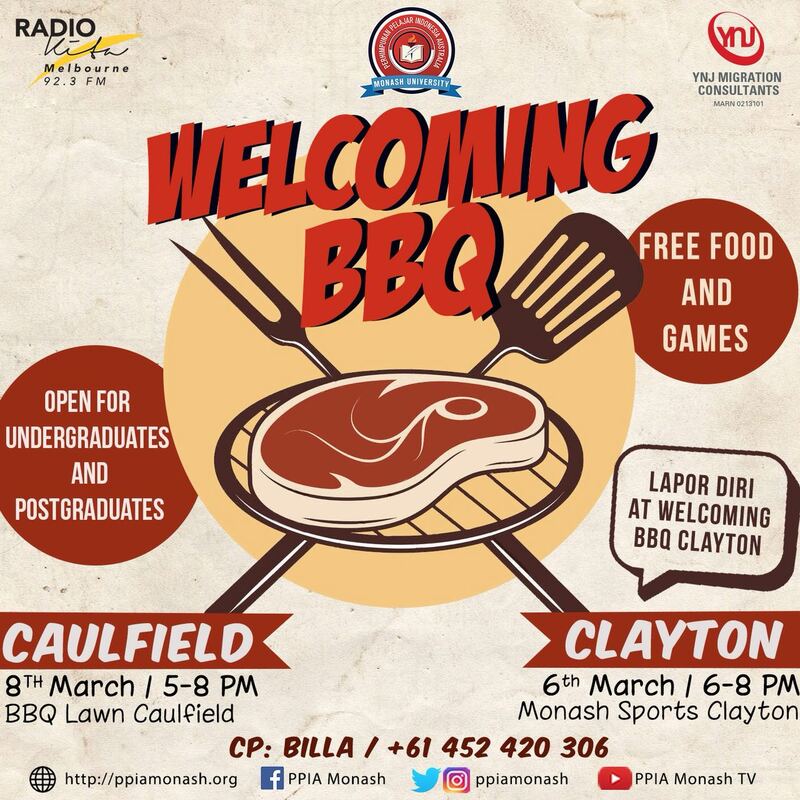 Come join the fun at BBQ Lawn Caulfield on the 8th of March from 5-8 pm and Monash Sports Clayton on the 6th of March from 6-8 pm! Copyright © 2018 PPIA Victoria, All rights reserved. Copyright © 2016 PPIA Victoria. All Rights Reserved.